WATSON, George William of Calgary, Alberta passed away peacefully at Foothills Medical Centre on the morning of November 30, 2018 at the age of 71. The oldest child of Grant and Janke (Jenny) Watson, George was born on May 31st, 1947 in Leamington, Ontario where he grew up on a 100-acre working dairy farm in Wheatley with his five surviving siblings: Howard, Dwight, Harold, Sonya and Roger. George always exceled with numbers and graduated from Queen’s University with a Bachelor of Science in Engineering (1970) and an MBA (1972), an AMP from Harvard University, and completed the Stanford University’s Director program. While George’s education and career were always at the forefront, his most important achievement at school was his courtship of Sheila at Queen’s University, culminating in marriage on April 29, 1972. George and Sheila shared the last 48 years together, creating a family legacy George was immensely proud of, bringing three children – Eric (Kim – nee Sullivan), Tara (David) Ramsden-Wood, and Scott (Beth – nee Silliman) – and seven grandchildren – Ella, Ben, Katelyn, Andrew, Georgia, Abigail and Rebecca – into the world. In recent years, George took great joy in observing his grandchildren from his favourite chair, never missing an opportunity to tease them or capture one in the grip of his legs. George’s distinct laugh, his slow walk hobbled by multiple hip replacements, his unfiltered honesty/opinions, his generous 3ft personal gimmes on the golf course that allowed him to keep pace with Sheila, and his understated but ever-present love will be deeply missed and always treasured by his family. In work as in life, George was fiercely driven and competitive, always striving to succeed. George started his career in banking with CIBC in Toronto, where amongst other duties, he had responsibility for the Dome Petroleum account. Liking what they saw in the talented young man, Dome hired George away from CIBC as the Vice President of Finance in 1981 where he assumed responsibility for Dome’s restructuring effort, one of the largest in Canadian history at the time. In 1988, concurrent with Amoco’s purchase of Dome, George assumed the role of Treasurer of Amoco Canada. Facing the prospects of moving his family away from Calgary, George left Amoco for the role of President and CEO of Intensity Resources. His tenure at Intensity was short-lived as George would accept the role of CFO for TransCanada Pipelines (June 1990) and later be promoted to President and CEO (March 1993 to July 1999) at only 45 years of age. The TransCanada role had an enduring impact on George’s career, personal life and health, but with no regrets. After TransCanada, George would go on to co-found a company with his oldest son Eric. The company was merged into what is now Critical Control Energy Services Corp. where George served as CEO from 2002 to 2007, and Chairman from 2007 to June 2018. 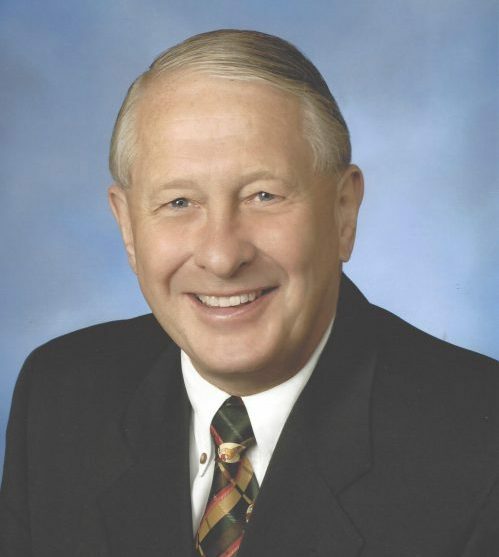 Throughout the years, George served numerous directorship and advisory roles for a myriad of companies and non-profit associations. Some of the most prominent include: Conference Board of Canada, Interstate Natural Gas Association of America, Canadian Energy Pipelines Association, Queen’s University, Calgary Olympic Development Association (CODA), TransCanada Pipelines, Teekay LNG Partners LP, Puget Energy and TD Bank. George will be remembered as both giving and frugal. He was an active fundraiser and contributor to Queen’s University and many other charitable causes. George was also extremely giving of his time, often spending hours at the Bow Valley Club chatting with/mentoring strangers seeking insight into his thoughts and experiences. George’s impact on the energy industry in Canada, and to those who knew him, was broad and deep. His contributions to the many he mentored and influenced will live on forever. George also didn’t miss a chance to save a buck (or two). Throughout his entire career, George would religiously pack and bring his own brown bagged lunch to work every day because he thought eating out was wasteful. Rooted in his upbringing, George always lived modestly and well within his means. In his prominent years, George did everything with great ferocity and determination both in and out of work. He enjoyed battles on the squash court (until his hips began to fail him in his 40’s) and was renowned for his daily 1-hour workout on the stair machine at the Bow Valley Club. Despite his unorthodox swing that he attributed to his bad hips, George enjoyed playing golf which he undertook almost exclusively with his family over the past 20 years at the Calgary Golf & CC, Fairmont Hot Springs and the South Okanagan. In recent years George even started to enjoy leisure travel with Sheila, something he had little time for during his prime working years. Trips to New Zealand, South Africa and Hawaii were recent highlights. Time softened George and he became more patient, giving and compassionate. While he was never one to express his feelings verbally, his love for his family was evident in his actions and his smile. His body may have failed him, but his spirit lives on through all of his children and grandchildren. He will be missed. We love you George. The family would like to thank the wonderful care provided by Home Care Assistance. A celebration of George’s life will be held at 4pm on January 2nd, 2019 at the Calgary Golf & Country Club. Given that George was well known for his colourful knee high socks that he adorned on (and regrettably off) the golf course, we ask that you consider honouring him by wearing something similar during the celebration. In lieu of flowers or other gifts, we also ask that you consider a donation to the Alberta Heart & Stroke Foundation at https://www.heartandstroke.ca/get-involved/donate. Condolences can be posted online at www.cochranecountryfuneralhome.com. Arrangements entrusted to Cochrane Country Funeral Home ph: 403-932-1039. It was a privilege to work with George for many years. So many laughs along the way. I’ll sure miss his sense of humour and quick wit. I was also fortunate to spend time with Sheila and watch the kids grow and start their own families. George will be missed. I had the privilege of knowing George for 28 years. He was a great kidder and always teasing, and making me laugh. Also making sure there was always a wonderful glass of wine . I have also had the privilege of being Sheila’s friend for 28 years going through many things together. My heart breaks for the whole family and know George will be missed by so many. My condolences to you Tara, David, Ben & Andrew as well as the rest of your family. Your dad was a great man, fun to chat with & I’m sure he will always be remembered. What a wonderful full life he has had. Hugs to you all, thoughts are with you. Dear Tara and David, our condolences to you and your family in the passing of your dad. He was the President and CEO of TCPL when Liz worked there years ago. And when we met him at Craig’s and Katrina’s home in Denver, we enjoyed our short chat with him and your mom that night. May he rest in peace. Our condolences to Sheila and family. George and I go back to Dome days when we were both young and fearless. It was good to know you George. Rest peacefully. Our thoughts are with you and your family. George was a founding member and Limited Partner of the Bow Valley Club. We enjoyed his regular visits to the club for exercise, lunch and shared conversations. The BVC staff and members will always remember him and send our condolences. George will be missed. Condolences to Sheila and the Watson Family. I only got to know George a bit towards the end of his life, but it was obvious that he was a man of character, integrity and also humor and a love of life. It was a pleasure getting to know him and Sheila, and sad to see him gone too soon. He accomplished a lot in his life, and I’m sure he will be missed by many. May he rest in peace. Our deepest condolences Eric and Watson Family. Our thoughts and prayers are with you during this most difficult time. I have already missed the glass of red wine with George at the club. A friend for many years, I treasured his business and political commentary. To all of the Watson family… George will be greatly missed. He fought so hard for so long, and will always be treasured in our memories. I’m deeply sorry for your loss. Our sincere condolences to you and all the family on the passing of George. I sure liked him and the way he dealt with business matters. I admired his competitive spirit in everything he undertook. We wish to express our deepest condolences to Sheila, Eric (Kim and children) Scott (Beth and children), Tara (David and children), for the loss of a husband, father, father-in-law, and grandfather. As neighbors and friends we shared many a glass of wine with George and Sheila over the years as well as many laughs and thoughtful discussions about his mother-in-law, the oil and gas industry and the political climate in Alberta and Ottawa. The one thing that stands out for both of us about George was his deadpan humor and laugh, but mostly his laugh. I’ll never forget the time a number of years ago when Marilyn was down by the bird feeder feeding our now domesticated red tail squirrel (Chip). Actually there were many of them, but who could tell the difference. George was outside in the backyard relaxing on his deck with one of his big stogies and I was puttering around in the backyard myself. All of a sudden out of nowhere an incredible loud shriek comes out of Marilyn’s mouth and then yelling and screaming and swearing at Chip. Well, low and behold, Chip was so excited to see Marilyn with the peanuts he ran straight up her leg. I don’t know if I was laughing harder at Marilyn or at George laughing at Marilyn. The whole situation was just so funny. We had no idea how accomplished George was in business until we read the obituary, but that’s probably why he confessed to us that the only thing he failed miserably in was retirement. It was really painful for us to see George deteriorate physically and mentally in the last few years, but through it all we never heard him once complain about his many unfortunate predicaments and health issues. We know George loved golfing, almost as much as he loved his family. Up to a few months ago, while he was watching golfing on TV, he told us that his goal was to shoot a round again sometime in the future. It was certainly an ambitious goal, but one he never realized. That was the way George was, a fighter to the end. George was taken from us way too soon and we will miss him dearly. He will always share a special place in our hearts, especially everytime we borrow a tool, or ladder, or crutches from his well stocked garage. My sincere condolences to the family. George was my mentor and protector to me at TransCanada and just a helluva a guy. I cannot remember how long I knew George, but it is a long time, though we had lost touch in recent years. We had a regular squash game for years, first at the Winter Club and then at the Bow Valley Club. Latterly, we played a game we called “old man’s squash” whereby it was a gentleman’s agreement that if either player hit a particularly good shot, the opponent was honour bound not to attempt to return it and rather express great admiration of the opponent’s talent and tactics. Even thinking about it now brings a big smile to my face. A life well-lived ended too soon. My best wishes to Sheila, Eric, Tara, and Scott. He was so proud of you all. My sincere condolences to Sheila and family. I was shocked to hear the news earlier today. Having worked with George for nearly 20 years at Dome and TCPL I will never forget the good and more difficult times. George has passed much too soon. Eric, I know that your fathers death is a great loss to you and your family. After reading his accomplishments, I can see that the entire community benefited from your father’s involvement over the years. Please know that you and your family will be in our thoughts and prayers. Eric: So sorry to hear of your loss. My sincerest condolences to you & your family. So sorry to hear the news about George. I enjoyed working with him at TranCanada, especially in his CFO role. I always appreciated his straight forward no nonsense approach – you always knew where George stood! He has left far too soon, but accomplished so much in his time and touched so many people, his memories will live on. My sincere condolences to the family. Please accept my deepest condolences on your loss, which is shared by so many. I have such fond memories of George from my time as the Queen’s University representative in Western Canada. He was one of the first alumni to connect with me and I knew from that day forward that he always “had my back”. His support was invaluable and I will cherish my memories of him. More than a few of his good phrases and thoughts will remain with me. I am so very sorry for your loss. Please accept my condolences. George was a great man who always managed to brighten my day any time I saw him. He will be missed. So sorry for your loss Eric. Your father was a remarkable man. Our condolences as well to your mother and the entire Watson family. To Sheila and all of the Watson family. Please accept our condolences. George’s competitiveness on the squash court, his dedication to his jobs, his sense of humour, his perseverance despite his health set backs and his great socks will all be missed by our family as we have spent many hours together over a great many years. What a GREAT name-George! I never knew George but I was born in Wheatley, Ont. and played some golf in Cochrane. Also, I too am an Engineer- too bad George did not persue same in his profession.My family from Leamington area married into the Watson family – namely Manly Watson and a Howard Watson married Mary Ellen Collison. Too bad we were so close but not aware of each others existence. Sounds like a wonderful life and you are now onto another journey. WAY TO GO MERSEA TOWNSHIP. Many condolences to Sheila and family. Fond memories of George Worked with him on on the TransCanada Power Board…..George was very bright..and no “softy”. He expressed his ideas boldly..lots of bluster. At the same time he was respectful of “other” ideas..Lively debate always Indeed..it was an energetic and stimulating environment with George Later on.. chats on the street..at functions or at the BV Club were the same…I enjoyed it and him.. alot He was a terrific character…Fine fellow.. Warm wishes and hugs ..
Sheila & Family- Our deepest sympathy on your loss of George- he was a one of a kind guy. When you saw that twinkle in his eyes you knew something out of the ordinary was about to happen! Always enjoyed our interactions with George. Our sincere condolences on your loss of George . I will always remember George. He always had a twinkle in his eye , especially when he shook my hand after beating me badly on the squash courts , even though he was playing with a really bad hip at the time. I can also remember him at social occasions telling his jokes , and then his laugh. My condolences to George’s family. I have fond memories of George when he was at Dome and I was engaged to assist Dome during the Amoco acquisition. Dome stood out as a treasure to Dome. He was highly respected by the investment community and all who came to know him. We continued to keep in touch during his days at TransCanada. Few have reached the corporate successes George achieved. Sheila, you may not remember me but we golfed a few times when John and I used to spend summers in Calgary, we were also friends of George and Rosemary Hugh. Anyway, I just wanted to express my condolences on the loss of your husband. I hope he did not have too much of a difficult time. Your family and friends will help you through this, it has been a year since I lost John and am so grateful for the love and support of mine. I was saddened to read in today’s Globe about the passing of George. I had the pleasure to work with George for many years on the Critical Control board. I recall many great discussions about keeping the company going and planning how to make it grow. We also had the occasion to spend some time together on the golf course – I don’t recall George being as generous in granting gimmees as he was in taking them, but it was always a fun competition. Sheila, I extend my sincere condolences to you and the family. George, rest in peace. To Sheila and family: my condolences to you. I was heart broken to hear the news of George’s passing and share in your sadness. George was a mentor to me for many years and I learned so much from him. And I will never forget his sense of humor. I was so sorry to hears the news of George .Will always remember the Dome days ,he truly was one of a kind. My condolences to you and the family . My friend George, was Prince of a Man, unpretentious, no entourage, no B.S., just a genuine person. When he asked you “How are you doing today”, he actually meant it, as the bartender down at the club he would listen to my rendition of the days’ events, as if it would matter to the CEO of TransCanada, but it did! My Condolences to the Watson Family and Multitudes of Friends. I met George through my father who worked closely with George and Brian Little at Dome Petroleum. Although I didn’t know him well, he impressed me as a strong character with a very good sense of family. We were so sorry to hear about George. Lots of good memories of his energy and vitality from earlier times . Our condolences to you and your family. We will be away on the 2nd of Jan. but will wear the colourful socks in his memory. I was saddened to learn of George’s untimely passing. I first met George when I was an oil and gas research analyst at Levesque Beaubien in Montreal, and covered Intensity Resources. Amongst the hundreds of executives that I encountered during my many years as an energy analyst, George stood out. He was friendly, sophisticated, smart, and genuinely knowlegeable about the true workings of the capital markets. He was also a genuinely good person, who cared about others. He was truly a delight to meet and work with. We used to joke that we may be related, as our families both originated from southwestern Ontario (he from Wheatley and mine from Tilbury). I later worked for many years at CIBC Woood Gundy, where they still held George in high regard. I do not know George’s family, but wish to convey my sincere condolences, nonetheless. My condolences to you and your families during this difficult time. George was a great man and father, and grandfather to be sure. I spent many afternoon’s with Eric at his parent’s house getting into all kinds of trouble (no house parties though..), eating their food (thanks Sheila! ), and thinking about the future… Your dad seemed to always enjoy having all your friends around (if not he hid it well or didn’t know/was away… lol). Golfing with you and your dad back in the day was always a great time… with the best part seeing him always find a way to beat you, even with his bad hip (this story might be fiction but my memory has it this way). I will always remember George’s laugh… Rest in peace George. We are regrettably not able to attend the celebration of life on June 2. On this day that you are celebrating George’s life we just want to let you know that although we can’t physically be there we will be with you in spirit and keep you in our thoughts and prayers all day long. Dear Sheila and family, our sincere condolences for your loss. We’d hoped to extend our thoughts to you at today’s celebration, but changing travel plans have denied us the opportunity. I’ve travelled many roads with George since we first met May 1st, 1981, when George left CIBC for Dome and I left Deloitte for Turbo. Little did we know then what challenges we would face over the next ten years! We put those lessons to good use at Country Hills GC and subsequent business ventures. He played a pivotal role in the one of Canada’s most significant business combinations. George has left us many, many happy memories. We will miss him, as will all of you. Safe travels!